Camarillo, California, May 11, 2011 – PBS Biotech, Inc., a developer of state of the art bioreactors to be used in the fast growing biotechnology market, announced today the launch of its innovative PBS 3 single-use bioreactor system. This novel bioreactor, designed by cell culture scientists and engineers, offers a more rapid and cost-effective development option for new biological therapeutics and vaccines as well as emerging biosimilar products. 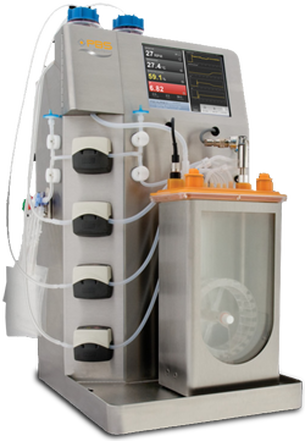 The PBS 3 bioreactor with its patented Air-Wheel™ system employs a unique, low shear, pneumatic mixing mechanism, and has a 3-liter maximum working volume capacity. The unique feature of fast mixing with low shear stress and high oxygen transfer rates enables the cultivation of a wide range of animal, plant, and insect cells. This widens the potential for development of new monoclonal antibodies, therapeutic proteins, and vaccines as well as stem cells for personalized medicine. Launch of a complete line of larger, fully scalable bioreactors through commercial scale production size will follow over the next several months. The PBS 3 is a fully integrated and pre-configured system with powerful process control capability in one-third the size and weight of competing systems. The benchtop unit can be installed by a single operator within minutes and securely monitored or controlled using the touch screen or remotely by computer or smart phone, including an iPhone® or iPad®, over a secured Internet or Ethernet connection. The disposable vessel is constructed of USP Class VI plastic to meet the cGMP regulatory requirements. Key product features include the Air-Wheel™ mixing mechanism, proprietary auto sampler system, and user-friendly graphical interface of the controller. “Our PBS 3 liter system is the most advanced laboratory scale, single-use bioreactors in the industry and is the first in our family of products. The bioreactor’s innovative, ease-of-use, and compact design will provide unique benefits and value to customers who want to gain operational efficiency and flexibility for reduced developmental cost and time,” said Dr. Brian Lee, co-founder and president of PBS Biotech and former senior scientist at leading biopharmaceutical companies Amgen and Merck & Co.
“We are grateful for the support of our Advisory Board and the dedication of our product development team for their time and inspired ideas in creating the most advanced single-use bioreactors,” Dr. Lee added. PBS Biotech boasts pre-launch product trials and evaluations in numerous biotech and academic research organizations in North America, Europe, and Asia. “The PBS 3 single-use bioreactor leads the way for scientists to upgrade existing equipment by adopting an entry level platform that is fully scalable from lab to production stages. We are particularly encouraged by the value proposition that we deliver for global biosimilar companies entering the market,” said James B. Schultz, VP of Sales and Marketing. Biosimilars are generic biological drugs that are similar to the original branded products. The market for these generic products is expected to grow from $250 million today to over $4 billion by 2014 globally. Production of biosimilar products is extremely cost sensitive and requires significant operational efficiency and flexibility, which can be benefited from broader and immediate adoption of single-use bioreactors and related disposable products.